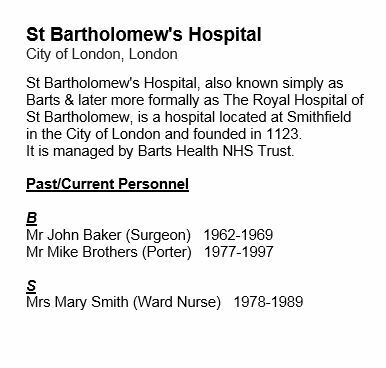 The example below shows what an Inscription would look like under each hospital/clinic in the publication. The final design layout is subject to change. In July of 1948 the Home Secretary, Aneurin Bevan, opened the first National Health Service hospital in Manchester. That historic launch gave birth to the indelible founding principle, "care for all on the basis of need not ability to pay" and that meant that all health services became available free at the point of delivery. That promise which sits at the very core of the NHS has remained steadfast and very much alive as the NHS approaches its 70th birthday. However the NHS of today which is responsible for 80% of all healthcare services in the UK is totally unrecognisable from the fledgling service that was born in 1948. The NHS today is a vast, complex social institution that employs in excess of 1.3 million staff covering thousands of hospital sites, GP practices, clinics, teaching hospitals and other healthcare institutions. Moreover in spite of the cutbacks, new policies, and fiscal restraints over the years, the NHS continues to grow, develop and improve the health and well being of our nation. New innovations, modern medical practices, Hi-Tech equipment and new pharmaceutical solutions have increased expectations and greatly lengthened life expectancy which has resulted in a growing and thriving ageing population. The truth is that the NHS could not have achieved its world class health service status without the strength, commitment and selfless dedication of its entire staff. From orderlies and porters, nurses and therapists to hospital doctors, specialists and surgeons, this vast NHS team of overworked and unfortunately, often underpaid, staff have made the NHS what it is in 2018. This July the NHS officially turns 70 years old and as NHS staff, managers and politicians who have led the NHS over the years look back, the most striking observation is that the institution that exists today is totally unrecognisable from its humble beginnings in Manchester. The changes over the years have been dramatic, but there has been one constant, the NHS staff which has remained dedicated, devoted selfless and unflinching in the face of seemingly insurmountable hurdles at different times in the NHS history. From orderlies to porters, trainee nurses to senior nursing staff, from therapists, medical technicians doctors, consultants, administrators, managers and senior executives, all have pulled together to create and deliver a world class National Health Service. As the publishers of the NHS Yearbook -the Big Blue Book- which ceased publication with the explosion of on-line digital alternatives, we have agreed to publish a commemorative edition which will celebrate the birth, growth and development of the NHS through an historic narrative. This narrative seen through the eyes of past Health Ministers and other healthcare professionals will highlight some of the most remarkable achievements of the NHS and will be complemented by a series of inscriptions from employees from all parts of the NHS. The inscriptions are open to any and all current and past NHS employees. To qualify as an inscriber all you need to do is complete a short form which should take no more then a few minutes. People who would like to complete an inscriber registration form for a retired NHS staff employee or for a deceased employee can do so following the same procedure. There is a small administrative fee that must accompany the application which is £9.99. The fee goes towards the cost of editing, proofing and production. Unfortunately the editorial steering committee has set a maximum target for all inscriptions and we apologise that we simply cannot accommodate everyone. If you would like to take up the invitation for yourself or for someone else we urge you to do so at the earliest possible time to avoid disappointment. If you wish to apply for an inscription then please click on the "REGISTER" button opposite where you will find more information and terms & conditions. Please take the time to read these instructions to avoid errors and to ensure that your application goes smoothly. Every attempt has been made to ensure that the site and forms are user friendly, but should experience any difficulty please email us at info@70nhsfamily.com and we shall attempt to assist you. 70 years is an impressive milestone in the life of any institution and this is especially true of a public sector department which touches the lives of over 30 million individuals every single year. The National Health Service has gone through hundreds of major policy changes. These have had a significant impact on the range and quality of the care provided throughout the years, but in spite of that a recent report by the Commonwealth Fund, a US think tank renowned for its expert analysis of healthcare practises around the world, has ranked the NHS as number one for quality, access and efficiency. The report also goes on to say that the UK is somewhat of an anomaly when it comes to offering free healthcare to all. All other developed countries offer high quality universal healthcare via some kind of insurance or subsidy scheme as opposed to the tax funded system of the UK. What is incontrovertible is that the NHS is home to some of the finest clinical specialists and best trained healthcare professionals in the world. 'The NHS Family at 70' is a celebration of the healthcare professionals who inspire and amaze on an almost daily basis through long, stressful hours. It is an opportunity to mark your contribution to this wonderful, much loved British institution and to show that you have been a vital part of the NHS Family. It is with that premise in mind that we have set out the guidelines that must be adhered to when applying to be inscribed in the 'The NHS Family at 70'. The full Terms & Conditions are set out in the registration form.